With the introduction of our new Good Health labelling in 2018, we're making it easier for you to make healthier choices. The label will be on hundreds of products so you can be certain you’re selecting food that not only tastes good, but is good for you, too. 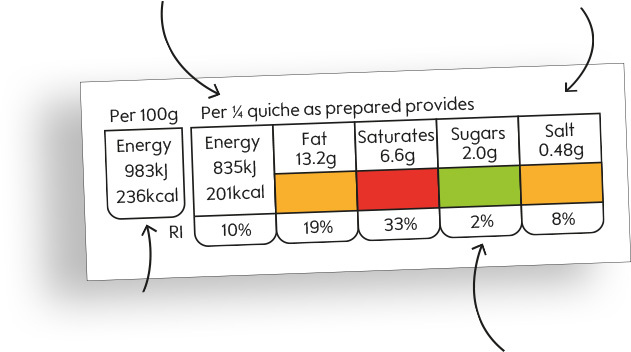 As the first retailer to use the Government's front of pack traffic light scheme in 2005, we have continued to follow the guidlelines for both front and back of pack nutrition labelling, providing customers with both informative and clear nutrition labelling. Public Health England has launched a plan to cut our calorie intake by 20% over the coming years. The recommendation is for 2,000 calories a day for adults. However, we currently consume an average of around 300 calories more than this every day. But we know it’s not just calories we need to look out for if we want to eat well, it’s the overall balance of nutrients. Which is why the traffic light labels on many prepackaged food and drinks in Waitrose and other retailers can be so empowering. 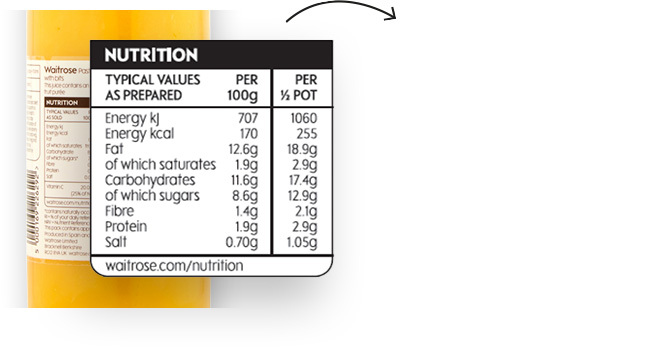 Check the pack for portion size. 2,000 calories (kcal) per day. the colour coding to compare two products. than the other, it’s the healthier choice. 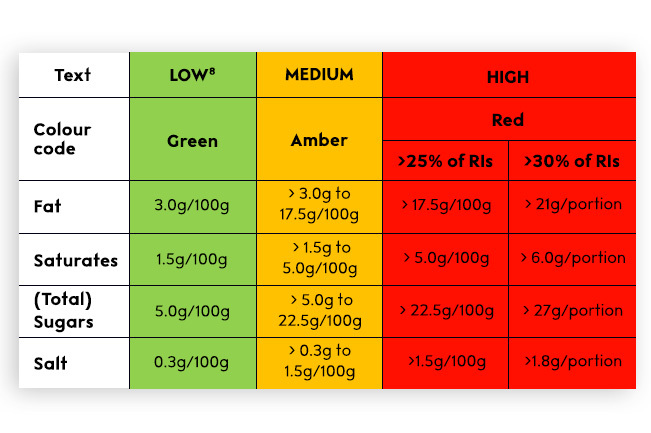 If you'd like to know why a green's a green or a red's a red, this table shows how the traffic lights of food products are calculated. Just because a product has one or more red lights, it doesn’t mean you have to avoid it altogether. can help you achieve a healthier diet in the long run. straight away whether a product is a healthy choice. Any product bearing the label will provide a clear nutritional benefit, helping you get the vitamins, minerals, healthy fats or portions towards your 5 a day as part of a balanced diet. 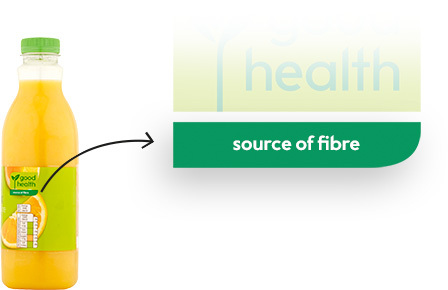 To carry the Good Health label, a product must meet the government guidelines on fat, saturated fat, sugar and salt – so you won’t see any red traffic lights, unless the fats or sugars are naturally present in nuts and fruit. 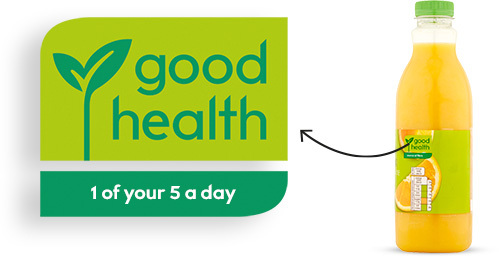 The Good Health label complements the traffic light label by highlighting the nutritional benefit on healthy choices beneficial to you and your family. saturated fat, sugar and salt. 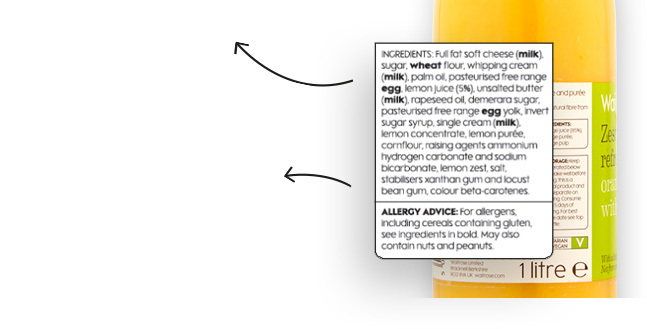 how all allergens are shown on packs. also show it per portion. us feeling full for longer, which is helpful for weight management. Protein plays an important role in the growth and development of muscles. products such as eggs, milk and yogurt. an important part of a healthy balanced diet and the best way to ensure we're getting more fibre and essential vitamins and minerals. Aim for at least 5 portions each day. Limiting the amount of fat in our diet helps to prevent weight gain and is an important part of a healthy, balanced diet. We need over 40 different kinds of vitamins and minerals every day for good health. Since there is no single food that contains them all, it is important to eat a wide variety of foods every day.